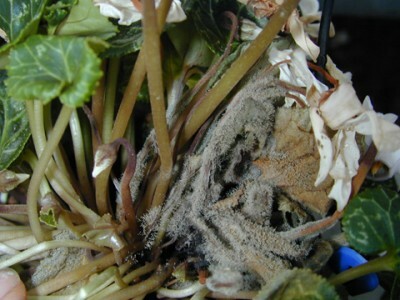 Botrytis cinerea, the agent of grey mould in cyclamen, attacks plants at all stages of development. Climatic conditions for cyclamen growing 15ºC to 20°C (59ºF to 68ºF) are ideal conditions for the spread of this fungus. The grey mould which afflicts ornamental plants is everywhere, and can attack cyclamen along with many other species. It is particularly dangerous in glasshouses, for it is here that it finds environmental conditions which favour its development. Cyclamen flower buds are highly susceptible. Botrytis cinerea belongs to the order Moniliales (or Hyphales) of the class Adelomycetes. They are of the Moniliaceae family, and are septate fungi: their mycelium is divided by partitions. Reproduction is asexual: this is in fact the asexual fungal spore (conidium) of Sclerotinia fuckeliana (syn. Botryotinia cinerea = B. fuckeliana), of the family of Melotiaceae of the order Discomycetales, class Ascomycetes. The reproductive apparatus consists of asci, bag-like cells enclosing spores known as ascospores. The asci are themselves enclosed in an ascocarp, making these fungi Euascomycetes (Higher Ascomycetes). The sexual form is not so common and harder to find. Botrytis cinerea is an airborne fungus. It keeps quite well in the soil in the form of small hard nodules, dark in colour, made of intertwined hyphae: these nodules are known as sclerotia or ‘resting bodies’. In this form, the life functions of the fungus are in slow motion and it can wait for a number of years for favourable conditions to return. These sclerotia can withstand temperatures from -2ºC (28.4ºF) to 33ºC (91.4ºF). The fungus is well adapted for living on dead organic matter (saprophyte) and can maintain a long continuous development on dead or rotting vegetation. Where the necessary temperatures and high humidity prevail (as for instance with condensation on plant organs which happens when cyclamen are grown under glass), the sclerotium can develop into a mycelium which produces conidia (spores) by simple budding-off from specialised parts. These spores are the agents of the primary infection of the plants. Water and wafts of air are the most effective transporters of the fungus in its spore form. Insects, such as bees and aphides, may also carry the spores. Cool temperatures combined with fairly high humidity favour this fungus. Botrytis cinerea is a non-specialised opportunistic parasite which attacks weak plants. In the case of cyclamen it develops particularly in autumn and winter. A single spore on its own is not generally capable of itself invading an intact leaf or stalk. The germinating filament that the spore puts out can only get inside the epidermis by a wound (leaf-fall scar, for instance) or lesions caused by other diseases. It can also make use of aged or shrivelled leaves, or of withered flowers. Infection can also originate with mycelium growing in organic matter which the host plant is in contact with and drawing nutrients from. A temperature of 15ºC (59ºF) to 20ºC (68ºF), a film of water on the leaves or a humid atmosphere, and insufficient light are all factors which encourage infection. Water makes diseased organs stick to healthy tissue more, which can lead to better propagation. Once in position, the fungus multiplies actively as a fruiting body which produces spores (conidia), recognisable as a grey dusting on the parts of the plant under attack. These spores are a source of many secondary infections. The fungus has a powerful array of enzymes at its disposal (polygalacturonase and pectin depolymerase-protopectinase) and uses them to make rapid progress in attacking healthy tissue within the plant. Too much nitrogenous fertiliser, or unbalanced nutrition, also favours its spread. Under ideal conditions for the fungus the incubation period is 15 hours. Grey mould attacks can produce a variety of symptoms, and the onset can be extremely quick. 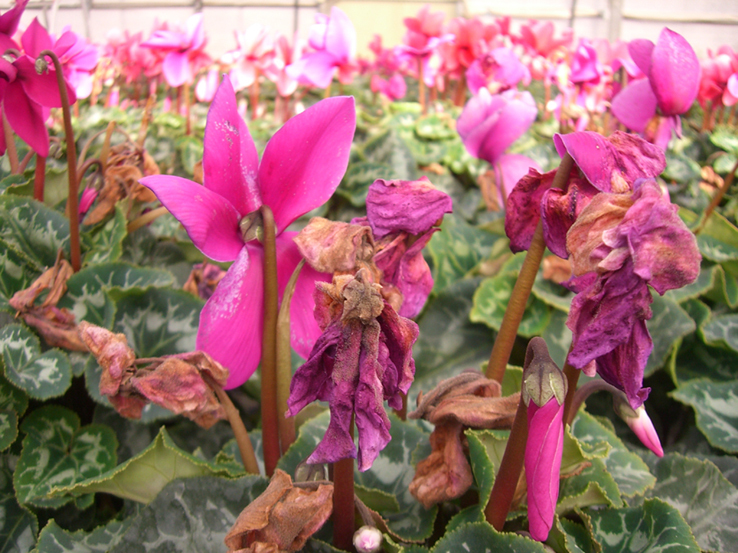 In the case of cyclamen, Botrytis can cause rot in the plant’s heart. This shows first as brown areas covered with a typical grey fuzz. Flower buds abort, open blooms dry out and their stalks die off. Both flowers and leaves then wilt onto the edge of the pot. There are often small dot-like stains characteristic of the symptom known as ‘ghost spots’. On the petals of a red- or pink-flowered plant, the spots appear with a thin ring around them of a colour darker than the rest of the petal. The centre then dies off. 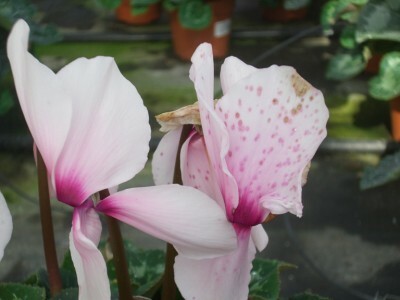 On white cyclamen the stain is brown with a transparent corona. Sometimes the whole petal is affected and has a burned appearance. Temperatures between 8ºC (46ºF) and 15ºC (59ºF) are particularly conducive to the formation of these marks on the petals. The fungus can also cause stains on the leaves. Broad, grey-brown patches of dead cells begin at the edge of the leaf and follow the ribs. Another effect is web disease, characterised by the formation of grey-white filaments on the compost in a warm humid atmosphere. At the stage where the disease is causing leaves and flowers to wilt onto the edge of pots by attacking the stalks, it is possible to mistake these symptoms for those of the Bacterial Soft Rot, Erwinia. The typical spore-forming stage will reveal the difference between the two. Botrytis cinerea infection presents a constant threat. It may attack any organ, and invade plants at any stage of growth. water early in the day, ideally without wetting the leaves. avoid draughts which may spread the spores. to handle plants carefully when pricking out so as not to damage them. Botrytis cinerea is not affected by pH levels. In having recourse to fungicides, you should be aware that this fungus is highly infective and ever-present in the growing environment. Results can therefore be quite disappointing, and may lead to resistance building up, unless you take care to alternate active ingredients. As a precaution, treat every 10 days: more often when there is a heavy attack. The constant development of the regulations and homologations of phytosanitary treatment products, and the differences in regulations according to each country make it impossible for us to include updated information on homologations. Each producer will have to contact his local plant protection bureau to obtain the latest updates concerning the regulations and use of phytosanitary products. We strongly advise testing beforehand on a plant sample in order to measure the chemical’s activity (establishing the dose) and any effect on the plant (plant poisoning).